in stock 1 pcs, Sending 23. 4. World – Estimated 25. 4. When will be in stock? Shall we let you know when the product is in stock? Enter your contact e-mail. LRP proudly announces the release of the long awaited IFMAR Worlds winning Flow X competition speed control. Its unique combination of hardware and software features was created to deliver maximum performance on the track without compromise for touring car racing. With this in mind, FlowX comes fully equipped to bring the best experience to the user in every racing situation. 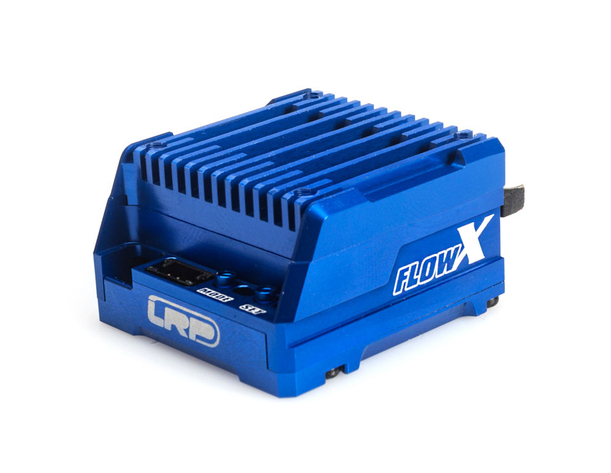 The Flow X comes equipped with completely redesigned power board and logic board to unleash the full potential of the new software and to provide reliability for today's extreme racing demands. 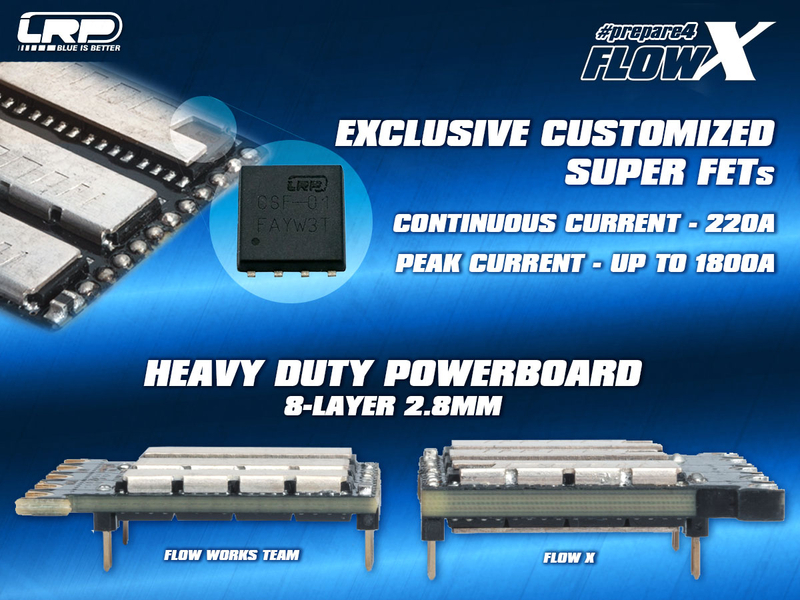 With 8copper layers and a total thickness of 2.8mm, the FlowX heavy duty power board achieves minimal resistance and drops core temperatures significantly. First time in use are LRP's exclusive Customized Super FETs CSF-01. To improve internal cooling further, new copper cooling plates come soldered on both PCB sides. Backed with a bulletproof 6V/6V BEC and newly selected high quality components ensure most consistent operation under extreme loads. Finally, rounded off with pre-soldered all black 12AWG power wires, short receiver lead and astonishing new dark blue full aluminium case with aluminium pushbuttons, the new Flow X will completely stand out and be perfectly fitted to any touring car chassis. The Flow X TC Spec comes pre-installed with the IFMAR Worlds winning v4.1 software. Smoother driving feel with maximum power output and consistently strong brakes were the main focus points on this new software creation. All new brake types developed especially for the Flow X will match any driving style and situation on track, while the new Torque feel, Timing and Delay features are to provide the smoothest throttle control with highest top speeds at any racing track. Timing parameters in Flow X have been completely revised and now feature exceptional improvements in terms of power delivery. To give Stock class racers the edge, the benefit from the feel of a pure LRP speed control is backed with the power board's low resistance, ensuring most direct motor control with minimum losses. By the time of release, LRP continues to use its well-known effective system for fast trackside adjustments with pushbuttons, with no need to use a separate programming unit. The Flow X speed control series however is designed to support external programming device which is planned to be offered later on. Combined with an all new user manual concept, the Flow X remains effective and easy to use for everybody. Sorry, we do not have enough quantity in stock for the selected product. If you want we can send you notification when product is back in stock.